Firefighters battle the Cranston Fire in Idyllwild. Photo via OnScene.TV. A brush fire in the San Bernardino National Forest in Riverside County burned at least 4,700 acres, prompting the evacuation of thousands of people, and is 5 percent contained Thursday. 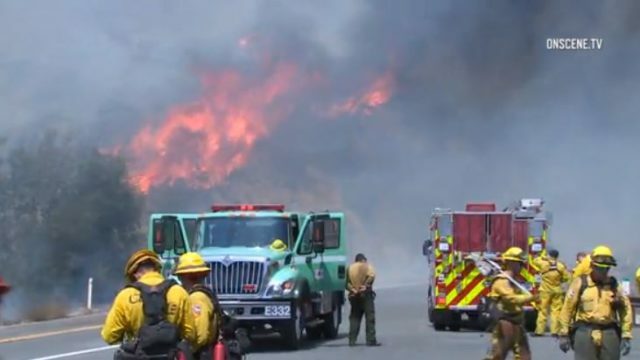 The Cranston Fire destroyed five houses and prompted road closures and the immediate evacuation of 3,200 people from nearly 2,200 homes in Idyllwild, Apple Canyon, the Lake Hemet area, Mountain Center, the Hurkey Creek area and Camp Scherman Girl Scout Camp since it erupted around noon Wednesday off state Route 74 in the forest area between Hemet and Mountain Center, according to the U.S. Forest Service. The fire was burning “with a rapid rate of spread,” the USFS said. Officials anticipated the blaze would spread to a number of mountain communities including Idyllwild, Mountain Center and Lake Hemet, the Desert Sun reported. The cause of the fire has not been confirmed, but a man suspected of setting multiple fires in southwest Riverside County, including one that became the Cranston fire, was arrested Wednesday. The suspect, identified as Brandon N. McGlover, 32, of Temecula, was taken into custody about 12:30 p.m. near Newport Road and State Street in Hemet and booked into the Cois Byrd Detention Center in Murrieta on suspicion of five counts of arson to wildland. Additional allegations are possible as the investigation continues, according to Cal Fire. The last time the area burned was about five years ago, the Desert Sun reported. Authorities established an evacuation center for residents and campers at Banning High School, 100 W. Westward Ave. Animals of all sizes can be taken to the San Jacinto Valley Animal Campus at 581 S. Grand Ave.
Small and large animals can also be evacuated to Dysart Equestrian Park, 2101 W. Victory Ave. in Banning, but the small ones will be transferred to the San Jacinto Valley Animal Campus. Residents can call (951) 358-7329 for assistance with moving animals. Road closures include state Route 74 between the Cranston Fire Station and Lake Hemet, as well as state Route 243 between the communities of Pine Cove and Mountain Center, where authorities say flames jumped the highway near the Idyllwild Grinding Facility. An excessive heat warning that was expected to end Thursday was extended to midnight Friday, according to the National Weather Service. Authorities have also issued a smoke advisory for the region, advising that winds could bring smoke into various parts of Riverside County, including the Coachella Valley, Banning Pass, the Hemet/San Jacinto Valley, Perris Valley and Anza. The advisory will be in effect through Thursday morning.